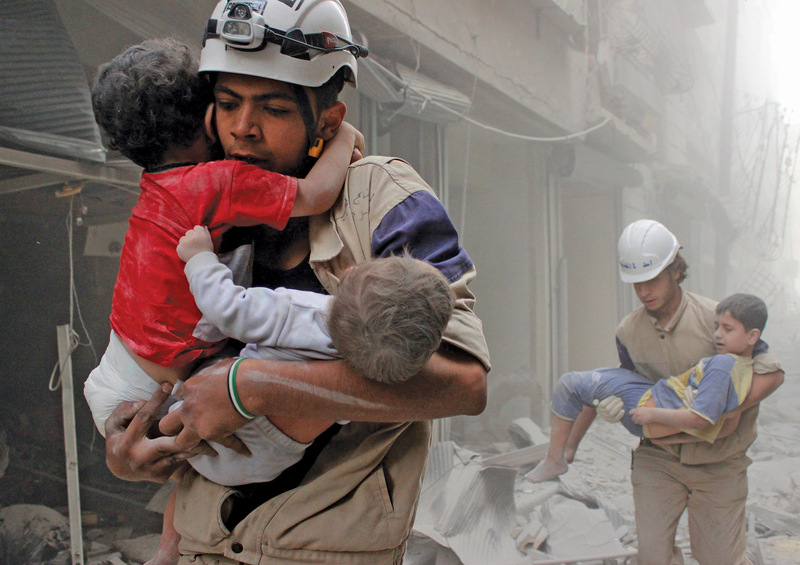 Members of the White Helmets rescue children in Aleppo after an air strike by the Syrian armed forces, June 2014. In February 2014, volunteers from the Aleppo division of the White Helmets raced to the scene of a barrel bombing in the city’s Ansari neighbourhood. There they pulled a boy and his mother from the ruins of their three-storey apartment. The woman was frantic: somewhere in the mass of broken concrete and twisted metal was her two-week-old baby. The volunteers worked through the night, dust whirling in the beams of their headlamps. After 12 hours, one of them was able to reach into a gap beneath a collapsed ceiling and lift the baby clear. It was unharmed. That baby was the youngest of more than 22,000 people rescued over the past three years by the White Helmets, a volunteer force that now numbers 2,087 men and women across Syria. They warn of impending bomb attacks, treat the wounded, fight fires, pick up body parts and bury the dead. But their first task is to rescue civilians trapped in the rubble of Syria’s homes, hospitals and schools. 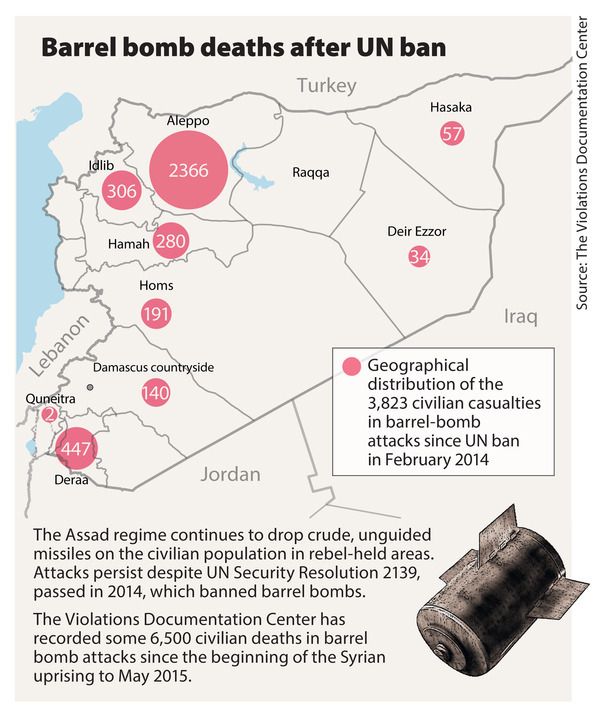 Most are victims of barrel bombs – oil drums or canisters packed with a mix of explosives, scrap metal and sometimes chemical agents, such as chlorine – that the regime drops on rebel-held areas. So far, 93 White Helmet volunteers have been killed. Often, after an attack, Assad’s helicopter pilots will wait until relatives and rescue workers have gathered before circling back to drop a second bomb. We are doctors, medics, tailors, metalworkers, carpenters, entrepeneurs, students, everyone. Before the war, I sold consumer electronics. The teams started spontaneously. In each area of Syria there were volunteer groups helping people in a very amateur way. We were all writing about it on our Facebook pages. So in September 2014, representatives of these local units got together under one leadership, with the same name and logo. When the Syrian army came into my town, Jisr al Shagour (in northwestern Syria), in June 2011, I fled to Turkey with my family. For nine months I worked there in the refugee camps. 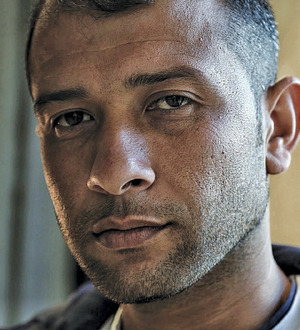 Then I decided to come back – because Syria is my country. I was one of the founders of an emergency group in the Idlib region, and they elected me as head. Our group was among the first to get professional training in Turkey. Gradually we began setting up other groups, until we had trained teams to work across the whole Idlib governorate. The work has become an obsession for us – helping people, saving lives. You can’t imagine the intensity of the happiness you feel when you pull someone out from under the rubble – where he had no hope – after long hours of working, and he is still alive. Is there one particular memory that stands out? I’ll never forget the massacre in Darkoush (in northern Syria), at the Eid al Adha celebration two years ago. More than 130 people died, and more than 250 were injured. A lot of children were blown to pieces. But at that time we couldn’t do anything because we just didn’t have the expertise or tools to help. We didn’t even have ambulances. I will never forget that day in all my life, what I saw, what I lived. Never. Never. Afterwards I had a breakdown and had to stay in hospital for a while. From that time on I decided I would never give up, that I would keep working with the White Helmets, so that there’ll never be another day when we sit there unable to help while people are dying in front of us. With so many dead and no end in sight, what keeps you going? Every day we pull people out, most of them children. This generation that we’re pulling from the rubble, these kids are going to build a new Syria. When you see this child that you pulled out of the wreckage growing up in front of your eyes, you feel hopeful. You’ve given this child a new life, to build Syria again. These men light our path. We’ve lost 92 men, and yesterday we lost another one in Zabadani, so 93 now. I had a good friend called Rageb Hamdoun. He was martyred in Binish, killed by a second bomb dropped on the same target. And I have other good friends who have lost limbs and been blinded. I have no words to describe those men, no words that can do them justice. The international community has lost all credibility with the Syrian people. Last year, the UN adopted ruling 2139 to stop the barrel bombing in Syria. But it is still going on. In March 2015 there was another ruling, stating that chlorine gas is a chemical weapon and banning the use of it in Syria. But after this, chlorine gas was used. For two years the Syrian people have been asking the international community for a No-Fly Zone, but no-one even heard us. As long as there are barrel bombs falling on civilians, how are we going to build communities, how are we going to build services and infrastructure in the liberated areas? We need to finish off the first source of terrorism, which is Bashar al-Assad, and then the second source of terrorism, which is ISIS. I am certain that when we’ve got rid of Assad, the Syrian people will be able to finish off ISIS.